Hardcover. New York, Hyperion, reprint, 1993, Book: Very Good, Dust Jacket: Very Good, 96 pages. Hardcover. Extensive color illustrations by various artists throughout. Red gilt titles on spine and cover. 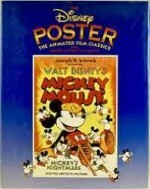 Includes small reproduction of poster for "Mickey's Nightmare." Includes chronology of Disney films. Clean, unmarked copy with only minor wear to dust jacket.